Have fun. Before brushing teeth, sing a song about “saving water for the fish.” Have your kid decorate cloth grocery bags with non-toxic pens. Pick out a colorful waste-free lunch box from Funkins or Bentology together. Take a ride on public transportation and explain to your kids why it’s good for the earth. 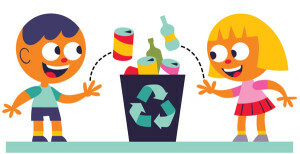 Celebrate America Recycles Day or Earth Day by throwing a waste-free party and pledging to step up your family’s recycling efforts. Purchase eco-friendly products like cloth diapers and biodegradable cleaners like those sold by The Honest Company.